The side effects of making machines more human. In the future, it's possible that robots will be able to prey on our emotions. Or at least, behave in a way that makes us more sympathetic towards them. Research carried out by the University College London (UCL) and the University of Bristol has discovered that humans prefer robots who are expressive and apologetic -- even if they're less efficient than a silent alternative. Fleshy controllers are also more likely to forgive a robot's shortcomings if they think criticism or flat-out rejection will upset them. 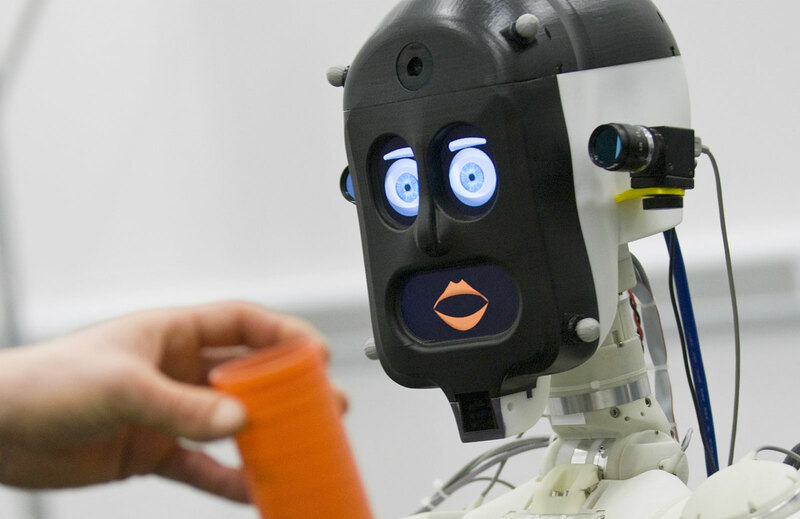 In a test lab, Bert2 -- a humanoid robot with three separate displays, allowing its eyes and mouth to express various emotions -- performed in three different ways. One was silent and made zero mistakes, while a second was mute and programmed to make a single blunder (which it would then correct, quietly). A third was able to speak and accept simple "yes" or "no" responses from the user. In a basic kitchen scenario, the vocal android would apologise for its mistakes -- after dropping an egg, for instance -- and give a heads-up when it was about to try a new technique. While the slowest, it was the robot that most people preferred. But here's where it gets interesting. At the end of the exchange, the robot would ask for a job. Some participants were reluctant to say no -- even if they preferred the silent, more efficient robot -- because they thought it would upset the machine. "It felt appropriate to say no, but I felt really bad saying it," one of the test participants said. "When the face was really sad, I felt even worse. I felt bad because the robot was trying to do its job." Another said "maybe" at first, but -- because Bert2 can only accept yes or no responses -- quickly changed their answer to "yes." Later, in a post-experiment questionnaire, they revealed that they actually preferred the silent, more reliable robot. According to the research team, one test subject wrote "emotional blackmail" on their notepad during the experiment. It's already been proven that humans can feel empathy towards robots. (We also have a good giggle when they fall over.) The new research by UCL and the University of Bristol, however, points to a deeper and more complex relationship with robots in the future. It's dependent on more expressive android interfaces, however, and the way human perceptions change. For now, there's a novelty factor -- we're willing to forgive a robot's mistakes because the experience feels so new -- but in the future, that could change. When I'm late for work and need a quick breakfast, I won't be too impressed when my robot butler spills milk all over the floor.